Respecting diversity is a core principle in social work education. Throughout their academic journeys, students are repeatedly reminded of the importance of practicing social work in ways that are sensitive to clients’ backgrounds and experiences. But if you look at the students and faculty at many social work schools, “diversity” is not the first word that comes to mind. And observers fear the gap between the ideal and the reality of diversity in social work education may grow larger as immigration and other trends bring an increasing variety of people into American society. In response, schools of social work around the country are stepping up their efforts to promote diversity in social work education. Much of the renewed focus revolves around recruiting students and faculty. Black Men at Penn School of Social Work works to strengthen the ties between the University of Pennsylvania’s Graduate School of Social Policy and Practice and the black community. One of the organization’s activities is to recruit men of color to the social work profession through workshops held at schools, libraries, and other community settings. It also provides potential students with information about social work programs at the University of Pennsylvania and other schools. So far the organization has recruited more than 75 men of color into the social work profession, Lassiter says. The organization’s community outreach approach is common among recruitment efforts. A similar strategy is employed at the University of North Carolina (UNC) School of Social Work. The school hosts an annual diversity open house designed to give a diverse mix of potential students—including students from historically black colleges and universities and Native American high school students—an opportunity to meet UNC students and faculty. The event’s benefits reach beyond students, says Travis Albritton, MSW, MDiv, a clinical instructor and director of the school’s Triangle Distance Education MSW program. Some institutions have turned to distance education to connect with potential students. For example, the University of Denver Graduate School of Social Work’s Four Corners MSW program targets residents of the tribal and rural areas of southwestern Colorado. One quarter of the students in the program come from the area’s Native American tribes, and Native American faculty members teach some of the program’s courses. One of the program’s primary strengths is that it provides Native American students with the opportunity to get a social work education and then go back and work in their home communities, says James Herbert Williams, PhD, a professor and dean of the University of Denver Graduate School of Social Work. Attracting Native American students is also a goal of Arizona State University’s School of Social Work. The school’s Office of American Indian Projects offers scholarships, mentorship, and research opportunities. A similar office is dedicated to increasing the role of Latinos in social work. Arizona State also recognizes that attracting diverse groups of students to careers as social work practitioners is only part of the diversity equation, says Flavio Marsiglia, PhD, distinguished foundation professor of cultural diversity and health at the school. He is also director of the school’s Southwest Interdisciplinary Research Center, which focuses on minority health and health disparities. Despite schools’ enthusiasm for diversity, barriers often hinder their efforts to recruit students and faculty from a variety of backgrounds. Top among these barriers is money, observers say. Many potential students don’t have the means to pay for social work education, and students who start social work programs sometimes cannot finish them because they can’t afford to take time from work to complete their studies. 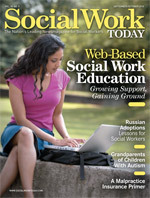 And then there are the perceptions—if not realities—that social workers don’t earn much money. Ivette Barbosa, MSW, BSW student services coordinator at Indiana University’s School of Social Work, often faces questions regarding salaries when she talks with people about pursuing social work education. Many people also fail to recognize the breadth of the profession, thinking it’s only for people who want to do microlevel practice, Barbosa says. Lassiter says he encounters people who only associate the profession with child welfare workers. Even if a school can recruit a student, retaining him or her can be a challenge. Social work students sometimes find that balancing school, work, and family responsibilities is overwhelming and they drop out, Marsiglia says. Difficulties in student recruitment and retention in turn make it harder for schools to recruit diverse faculty members. There are many strategies that could help schools of social work improve their chances of attracting diverse students and faculty, observers say. These approaches include an expansion of scholarship and loan forgiveness programs and additional efforts to reach out to school students before they reach college age. Schools that truly want to be successful in recruiting a diverse base of students and faculty must embrace diversity at all levels of their organizations, Albritton says. Lassiter believes schools of social work have a chance to not only promote diversity in their own profession but to become leaders for academic institutions in other disciplines. — Christina Reardon, MSW, is a freelance writer based in Harrisburg, PA.